From 1940, the state of Churchill’s health is theoretically well documented. Years after his death, it was customary to turn for health details to his doctor, Charles Wilson, Lord Moran. The physician’s diary-based book, Churchill: The Struggle for Survival, 1940-65, was thought a breach of the doctor-patient privacy by Churchill’s family and friends. Yet Moran was the accustomed source for information on Churchill’s ailments. In his book In Search of Churchill, Martin Gilbert revealed that some of Lord Moran’s alleged “diaries” were not contemporaneous with their dates. “The mind boggles at how much misinformation may have crept into the history books, mine included, by such routes,” Sir Martin wrote. It was soon apparent that Lord Moran could not have been near Churchill when certain entries were written. Since we did not know where we can give credence to what Lord Moran wrote, we lost our main—and copious—source of health information. Efforts to correct this lapse are underway by a number of medical experts. Two physicians, Dr. J. Allister Vale (National Poisons Information Service, City Hospital, University of Birmingham) and Dr. John W. Scadding (National Hospital for Neurology & Neurosurgery), offer a notable contribution. Though they use medical vocabulary, they also explain such terms, making their articles perfectly accessible to laymen. The authors skillfully weave old and new sources into a seamless narrative. This abstract describes their articles in chronological rather than published order. Vale and Scadding, “Winston Churchill, Dr. Robson Roose and Dr. Joseph Rutter: Treatment for Pneumonia in March 1886.” Journal of Medical Biography, February 2018: 1-8. Churchill’s first bout with pneumonia as a schoolboy is well documented. He writes of it himself in My Early Life (1930). His son Randolph discusses it in the Official Biography, narrative volume I and The Churchill Documents, Vol. 1. Vale and Scadding remind the reader of these sources, together with a correction. Churchill was wrong on circumstances of why he was sent to the Misses Thompson school near Brighton. Probably, delicate health did lead to pneumonia (right lung only, not double pneumonia as he states). But that was only one factor. Another was the physical abuse he received as his previous school at Ascot. There is a gripping narrative of young Winston’s progress towards the medical “crisis.” That was the word used by Dr. Roose when writing to Lord Randolph about Winston’s illness. It refers to “the turning point of the disease in pre-antibiotic days after which the patient either improved or deteriorated.” The story is useful to readers, like most physicians, who do not have The Churchill Documents. The boy’s gradual improvement from mid-March to mid-April, when the patient was “getting on well,” is far less dramatic. Before drawing conclusions, it is important to understand the realities of pneumonia treatment in the 1880s. In the event, Winston’s childhood pneumonia had no bearing on its reoccurrence much later, in the 1940s, [see next abstract], though his cigar smoking habit may have been important. Vale & Scadding, “Did Winston Churchill suffer a myocardial infarction in the White House at Christmas 1941?” Journal of the Royal Society of Medicine 110/12 (2017) : 483-92. Lord Moran (then Charles Wilson) was on the job as Churchill went to Washington after Pearl Harbor, for lengthy conversations with President Roosevelt. His health suffered. He apparently suffered a “myocardial infarction” (heart attack or coronary thrombosis). Moran’s biographer, Richard Lovell, is important to the story because he researched and wrote about the drugs Moran may have prescribed to Churchill, providing precious clues to medical professionals on how Moran perceived Churchill’s health. The key dates of this episode encompassed Churchill’s stay in Washington from 22 December to the 27th. On that evening Churchill complained of pain in his chest. Lord Moran wrote later that he decided not to tell him this was caused by a “coronary insufficiency.” Instead he said, “Your circulation was a bit sluggish. 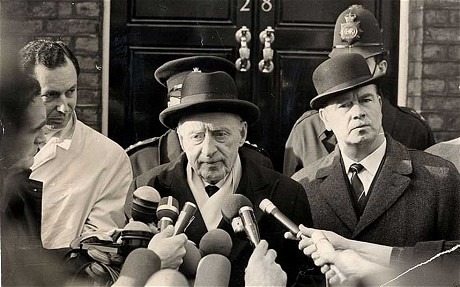 It is nothing serious.” In fact, Moran decided to have Churchill examined by an eminent cardiologist, Dr John Parkinson, once they were back in England. This consultation did not take place until 10 February 1942. Meanwhile, Churchill traveled to Canada and Florida, ending up finally at Bermuda, where he boarded (and sometimes piloted) a Boeing Clipper flying-boat that took him back to Britain. Vale & Scadding, “In Carthage Ruins: The Illness of Sir Winston Churchill at Carthage, December 1943,” Journal of the Royal College of Physicians, Edinburgh, 47 (2017): 288-95. Our knowledge of Churchill’s near-death experience in Tunis is abetted by the unpublished autobiography of Lieutenant Colonel R.J.V. Pulvertaft, then assistant director of pathology, Central Laboratory, Cairo. This constitutes the main point of interest for scholars already familiar with Churchill’s account, and the numerous diaries and memoirs which allude to the incident. Within twelve hours of Churchill taking ill, an American hospital in Tunis provided portable x-ray apparatus and an electro-cardiograph. Pulvertaft also obtained sulphadiazine, which he administering after lunch the next day. By 27 December, Churchill was well enough to leave his sick room and inspect troops outside. Vale & Scadding, “Sir Winston Churchill: Treatment for Pneumonia in 1943 and 1944.” Journal of the Royal College of Physicians, Edinburgh 47 (2017) : 388-94. New and previoiusly unpublished material is offered from two attending staff members. Nurse Doris Miles wrote letters to her husband during Churchill’s episode of pneumonia in February 1943. Nurse Dorothy Pugh kept a diary for the whole period. Brigadier L.E.H. Whitby, Director of the Army Blood Transfusion Service and an expert on sulphonamides, was called to reinforce the team. Subsequent health bulletins were signed jointly by Moran, Marshall, and sometimes Whitby. The report of March 1st stated: The Prime Minister’s condition is improving daily. He is getting up, and no further bulletins will be issued.” Two days later, Churchill left London for Chequers. Churchill’s next attack of pneumonia—shorter and less severe, it turned out—occurred in the last days of August 1944, on his return from Italy via Morocco. The same team—Moran, Marshall and sometimes Whitby—followed him, vigilant of his temperature, which remained too high for their comfort. Churchill did not want to miss his rendezvous with President Roosevelt at Quebec (12-14 September). Moran finally gave the go-ahead, asking Dr. Whitby and Nurse Pugh to come to Canada with him. Once more, all went well. Some interesting statistics: Churchill was sixty-nine in February 1943 and seventy in August 1944. While the overall mortality from pneumonia in the early 1940s with sulphonamides was 10%, the mortality was 20% for those in their sixties and 40% for those aged seventy or over. Readers may draw their own conclusions of Churchill’s ability to recover from potentially mortal attacks. Of course these accounts do not discuss his smoking or intake of alcohol. Certainly they retard recovery, whatever the quantity. Yet in February 1943, Churchill agreed to lighten his workload “only partly,” and maintained his “usual output” during the August-September 1944. when his illness was shorter and less severe. It seems certain that Churchill had an exceptional constitution, corroborated by the very convincing and accessible arguments of these two medical experts. Antoine Capet, FRHistS, is Professor Emeritus of British Studies at University of Rouen, France. He is author of a new reference work, Churchill: Le Dictionnaire. Abstracts are intended as synopses of contents, not as reviews or endorsements of the papers or articles covered.